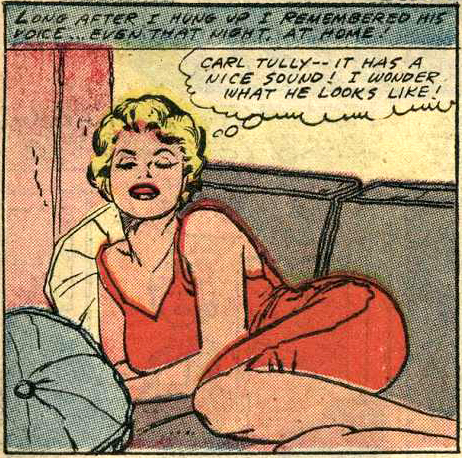 Art by Charles Nicholas & Vince Colletta from the story “Possessed” in BRIDES IN LOVE #8, 1958. He has such a nice voice. Very charming. I’ll bet he’s handsome too. And maybe he’s rich. But the poor guy probably doesn’t know how to spend his money to have fun. Gosh, I could help. And he’ll be so grateful. We’ll fall in love. But I won’t accept his proposal until at least the second date…because I don’t want to appear too eager!